I am naturally very interested in the former employees of the government. It seems that the administration has considered all former employees as collaborators and as such they were all dropped from the service. Osmeña has somewhat qualified this policy and a few, like the teachers, have been reinstated. But the great majority are still out of public service. Many of them are now suffering, the victims of the injustices of politics. I say injustice because they have been replaced by henchmen of the government moguls. I hope they will be reinstated immediately. My reasons may be seen below. When the Commission organized the government on Jan. 21, 1942, there was practically no government employee that wanted to reenter the service. But the government had to run and we did our best to persuage them to accept employment. They told us that they preferred to wait because the Americans would be back in less than a year. Anyhow, they said they had already received their three months’ salary. At the beginning, I was rather doubtful myself as rumors were very strong that an American Army and Navy Convoy were already on the way. But days passed, weeks and months passed, and no help was in sight, and in the meanwhile resistance in Corregidor and Bataan was weakening. The fall of Corregidor and Bataan was imminent — there was no indication that the Americans were coming soon. The employees held out as long as they could. But after they had spent their three months’ salary, most of them could not longer continue without employment. They were now drawing from the little savings they had. As everybody knows, unless a government employee is dishonest, he cannot possibly provide for the morrow. This the reason why I am now convinced that the insurance system of protection for the employees must be converted into a regular pension system. The insurance is just a temporary help; the pension is permanent and provides for the employee when he loses his job, or for his family after his death. With the pension plan we can retire old employees, and the employees will do their best to maintain an efficient record during the period necessary to entitle them to receive the pension. They will be honest as they know that if they become incapacitated or die, they can rest assured that their families will not live in misery. Going back to the government employees, a few of them engaged in business; but a great majority of them had to work and they were not fit to do anything else. They had to choose between employment or starvation. It is easy to say that for patriotic reasons, he should have preferred to starve and to suffer. But when his innocent little children began to clamor for food, they had to be fed — no explanation could sooth them. What was the poor father supposed to do? He could go around borrowing money or asking help from his friends. His friends may be very accommodating, but this could not continue for a long time because they also are not enjoying abundance. He looks for a job outside the government or any work which had nothing to do with the Japanese. The only pair of shoes that he still has wears out and he has spent his last money. What could he do? He could not go to the mountains leaving his family to starve under the mercy of the Japanese. He did not want to steal for he is a religious and perfectly honest man. What did he do? He went to the office where he had spent the best years of his life. He went there out of necessity; to live, to save his beloved wife and children. He served without the least intention of helping the Japanese since, having been reared in an atmosphere of justice and freedom, he could not possibly ally himself with men for whom such justice and freedom were a mockery. His whole thought, his sole aim was to save his family. Even then, there were many who resisted. I remember vividly one case and fortunately he is here with us because if I am wrong, he could correct me. I am referring to Mr. Pimentel, our Secretary. I met him one day (during the war) and asked him what he was doing. He said he was not doing anything and, although he was already in dire straits, he would prefer not to work with or under the Japanese. His information was that in six months, the Americans would be back. He said that he had sons in the USAFFE and he did not care to be in any way connected with the Japanese. I knew Mr. Pimentel as a man who was as poor as myself and that he had to work all the time to support his big family. When we parted, I saw the determination in his eyes to continue fighting the Japanese in his own way. But Bataan and Corregidor were crumbling; they fell shortly. He became convinced that the Americans could not come back in one year. He could not hold out that long so he decided to accept employment. Pimentel’s experience is the same as that of thousands and thousands of government employees — by necessity they accepted employment. In their hearts they did not for a moment waiver in their ardent desire to see the Americans back in the Philippines. They could not give any outward manifestation of their sentiments, as the offices were full of spies and the movements of officials and employees were watched closely. But inside their homes, among their immediate family, they prayed fervently for the victory of America. But many did not stop there. When the guerrillas became numerous and active, most of them joined the guerrillas in one form or another. I say in one form or another because, although there were many who were given official ranks, there were also many who did not want any appointment or sign anything for fear that they would be discovered. After all, they said, the important thing was to render service to the cause of America and the Philippines. No official papers or signatures could be more valuable than that. Like true heroes, real patriots, the material gain never entered their minds. How did they serve the cause of America and the Philippines? They served by furnishing valuable information, helping in every way those active in the guerrilla warfare, bolstering up the morale of our people, creating difficulties for the Japanese Army and Navy and the Japanese in general. These employees were the anonymous forces that helped. Their services were equally meritorious. To cite an instance of how they served. Ironically, this involved Mr. Confesor who seems to have had something to do with the formation of the present government’s policy involving former employees. Sometime in 1943, evidently as an answer to the appeal of Gov. Caram of Iloilo, Mr. Confesor wrote him a letter giving his reasons why he did not care to come down from the mountains and surrender to the Japanese. I was able to get a copy of the letter. It was a well written letter and his arguments were very weighty. It impressed me very deeply so much so that as I had always considered him a close friend of mine, I wanted to discuss the matter with him. Unfortunately I was not able to see him. I said that it was a good letter, but it contained an insinuation against which I must protest. I lost my two copies during the fire in my house and in my office. But I distinctly remember that there was a paragraph or some sentences referring to some speeches we delivered in Iloilo (in March or April of 1943), which in substance say the following: “You better prepare new speeches which you can deliver next July when the Americans will be here.” The insinuations were that (a) we were mere job-seekers; and (b) we were so insincere that we only say what would be pleasing to the ears of our hearers. This is not the proper place to answer such scurrilous accusations. For the present, I must make it of record that I have never been a job-seeker, and that I have always considered insincerity as one of the worst traits a man can possess. Well, I brought Mr. Confesor’s letter to Manila and placed it in my desk drawer at the office, together with many other important documents. Many employees had heard about the famous letter announcing the coming of the Americans and they were all anxious to get a copy. One day, a clerk of mine entered my office gasping. “What’s the matter,” I asked him. “Sir, they are distributing copies of Mr. Confesor’s letter,” he stammered. I was alarmed; everybody knew what was coming if the Japanese ever found out that a prescripted document like that letter was being copied and distributed in our office. It would have meant Fort Santiago for all of us and at that time the mere mention of that historic fort made everybody shudder. I investigated the matter and I discovered that, as I had just come from Iloilo and suspecting that I had a copy of the letter, my employees went through my drawers and found the copy. They made numerous copies using the typewriter in our office. Each and every one of them became a distributor of the letter and a propagandist of the coming of the Americans. I had to take unusual precautions to cover up that happening in my office. I understand similar incidents occurred in the other offices. Another evidence of the employees’ pro-American feelings. About 20 employees of an important bureau of the government were arrested by the “Kempetai” (Japanese Military Police). They were charged with being guerrillas and according to the Kempetai, the evidence consisted of a list of “guerrilleros” which they found. The matter was brought up to Malacañan. Naturally a promise was made to the Japanese that the matter would be investigated and proper criminal and administrative action would be taken against the guilty parties. All except the three supposed leaders, were released. I do not know what happened to those leaders, but they were probably released after the usual torture meted out to almost all those arrested. During the investigation it was discovered that if the guerrilla elements in all the bureaus were to be eliminated, there would have been almost complete paralization of the government. The whole matter was hushed and covered up. I do not recall anyone prosecuted or dismissed from the service for guerrilla activities or connections. More evidence of the attitude of the employees. Everytime there was a meeting or a parade, attendance had to be obligatory under heavy administrative penalty, otherwise very few attended. The employees offered all kinds of excuses to avoid going to the parade or meeting. In this connection, I would like to say something about the ex-officers and servicemen of the USAFFE. At the beginning, we were not sure what the attitude of the Japanese to their employment would be. Already we could observe that a good many of them were suffering for lack of means. We were able to convince the Japanese to allow us to employ these men. The argument we used, which we knew could never be true, was that these men sincerely wanted to be with the Japanese because they were beginning to understand that Orientals ought to be together. We devoted much attention to them. We issued orders reinstating them to their old positions and, as to the others who were not former government employees, we ordered that preference in hiring be given to them. 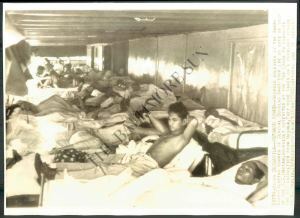 I can certify that inspite of all the hardships these men were going through, very few took advantage of our orders. Only those who would otherwise starve unless they earned something accepted positions in the government. Another fact that should be considered. In the last months of the Japanese regime, in view of the dangers in Manila, the food shortage, the financial condition of the government and the paralization of government activities, orders were issued for the release of the employees with payment of a certain amount of bonus. Everybody wanted to take advantage of it. If we had not rescinded our orders there would have been practically nobody left. There are the men that are now being punished. They are patriots in their own way. Perhaps their services were even more effective than those who now wish to monopolize patriotism. The only thing they were guilty of was that they wished to live, and managed to live. And because they survived the war, they are now branded as traitors; because they were unable and could not possibly go to the mountains, they are being placed on a worst ration than bread and water. It is said that something is being done — but the process is entirely wrong. A board of inquiry has been appointed to determine whether those seeking reinstatement could be allowed to return. My opinion is that they should all be reinstated and then the Board can determine whether they could or should continue or not. The difference is that in the first case, the employees are being presumed guilty and the burden of proving the contrary is thrown upon them. In the latter case, they are presumed innocent and they could remain in the service as long as nothing has been proven against them. Justice is all that I demand for them. It may be asked: If the conduct of the Japanese is as reported above why did we serve in the Japanese regime and later in the Philippine Republic? I had good reasons for not accepting any position in the Japanese regime. Aside from my past relations with America and the Americans, and the position I had held with the Philippine government which would make my acceptance of any position under the Japanese regime improper, I had plans which I could carry out only as a private citizen. I was Director of Marsman & Co. and President and Vice President of various Marsman enterprises, like the Coco Grove Mining Co., Marsman Trading, Insular Drug, Cardinal Insurance, Marsman Lumber, etc. Immediately before the war, Marsman & Co. further expanded its enterprises, by buying American Hardware and the Food and other departments of Pacific Commercial Co. There were also many new industries and businesses planned. Such was the condition of Marsman & Co. when the war broke out. The offices of the Marsman enterprises were in the Marsman Building at the Port Area. It was right next to military objectives. From the second day of the war, Manila Bay was bombed including the Port Area. A favorite target was Pier 7, considered the longest in the world, located probably less than 100 meters from our building. Bombing continued almost everyday until the day before the entry into Manila of the Japanese Army on January 2, 1942. I used to go to the office regularly although I did not have to. Employees were dismissed after 11:00 a.m. as it was noted that air raids commenced after that hour; nevertheless, I and other executives would remain in our offices and continue working as if nothing was happening. The bombs fell around the building. It might have been a military target as Admiral Hart, the Head of the American Asiatic Fleet, and the Navy General Staff had their headquarters in the Marsman Building. We had somebody in the building watch for Japanese planes and sound the alarm. We would all run down to the air raid shelters whenever he gives the signal; and when the planes were overhead, we would all lie down, cover our ears and open our mouths. I used to sit next to Admiral Hart in the air raid shelter located in the first story under the stairs. The building was also surrounded by layers of sandbags. Luckily, the building was never hit. There was only one bomb that fell behind the building about five yards away. All the windows of the building were shattered. I found several shrapnels inside my office which was on the 4th floor from which I got a good view of the pier. In my house, we built no shelter at all. We used to hide on the first floor on both sides of the stairs which was located at the very center of the house. We lined the walls with sandbags and placed boards and many other things on the second floor directly above us. No bombs fell near us but we could hear the detonation very well so that at times, they sounded like they fell just next door to us. We save planes dive down and drop bombs on Nichols Field. I never go out during an air raid. But I was caught in the streets twice when this occured. The first time I was luckily in front of the Bay View Hotel, a nine story reinforced concrete building. It seemed to be a safe place. The bombs fell in the bay near the hotel. The second time, I was in real danger. A special meeting of the Chamber of Mines was called and generally, either Vice President Ohnick or myself attended. We had agreec that Mr. Ohnick would attend that morning. The meeting was a special one called to discuss a very important matter concerning the mining industry. At the last hour, Mr. Ohnick decided not to attend and I had to rush to the meeting at the Pacific Building. This was the 27th of December, 1941. The meeting was hurriedly held and adjourned. I had sent my chauffeur to the bank to get some money and when after the meeting my automobile was not back, I had to borrow the automobile of the attorney of the company, Mr. Amando Velilla. I forgot to give directions to Mr. Velilla’s chauffeur not to pass through Intramuros (the Walled City) to go to Escolta but to go on to Padre Burgos St. outside Port Area. He drove through Intramuros, across the Malecon Drive and the air raid sirens sounded. Following instructions, we had to leave the car and seek shelter in the Myer’s Building. I entered a small compartment which had been converted into a very poorly built shelter. There were other people there, but they did not know me. Bombs fell all around. I heard the sound of an airplane which seemed to be flying very low. The moment I heard the sound I hit the floor, closed my eyes, covered my ears, and opened my mouth. Forthwith, I heard something heavy drop; then the building shook as the bomb exploded. The building was hit and shrapnel flew all around. When I dove, those around me laughed; they thought it was funny. I came through unscathed while many of the people around me were hurt. It was indeed a very narrow escape, but my satisfaction was that it happened while performing a duty for the company which had extricated me from financial difficulties. The Myer’s Building caught fire and burned down. The experience made me very cautious. The City of Manila had already been declared an open city; nevertheless, the Japanese planes continued dropping bombs. To protect people residing in the nearby municipalities, like Pasay, San Juan, Caloocan, these were also included in the open city. It was on December 28, 1941 when Japanese planes bombed the Treasury Building and the Philippines Herald offices located in a building on the other side of the former moat and wall around Intramuros, about opposite the Legislative Building. We were then having caucuses of both the members of the Senate and House to agree on the organization. When the siren sounded we ran to the shelter in the cellar. We were in the shelter until after three o’clock without anything to eat. It was very hot and crowded inside. The Herald had just written a strong editorial against the Japanese. It was also the time that the Church of Sto. Domingo and the Letran College were destroyed. In connection with the advance of the Japanese and the occupation of Manila, it was in the morning of the 8th of December that the war began. I remember the date very well as that is the feast day of my hometown, Taal, Batangas, and we were about to leave that morning for Taal when we heard the news in the radio about the attack on Pearl Harbor. A few minutes afterwards we heard the bombing of Baguio. At 12:30 p.m. the bombing of Clark Field was reported and at 3 o’clock that same afternoon Nichols Field was attacked. Nichols Field was only a few kilometers from my house at Malate so that the war was brought next door to us. As I said, although there was bombing almost everyday I continued going to work especially since I noticed that the other executives were always present at the office. Very few of the Filipino personnel came. We continued holding meetings of the Boards of Directors of the Marsman companies as usual, but many times they had to be suspended to go to the shelter on account of air raids. I remember that one of my last acts was to sign dividend checks declared by the Coco Grove, of which I was the President. Before the coming of the Japanese we took steps to have our gold bullion taken to Corregidor where the USAFFE was going to make its last stand. We also endeavored to send all the moneys of the Marsman companies to the United States. I remember that our last meeting was at the University Club and we left some of our papers there. While there, I telephoned to arrange the sending of money to the United States. Before going to the office, I would generally inquire from General Francisco about the situation of the advancing Japanese Army.He told me confidentially that the situation was very bad; that the Japanese were advancing very fast. I also informed my American friends and I advised them to withdraw as much of their deposits as they could. They refused on account of the official communique from the General Headquarters to the effect that “Enemies repulsed; no change in front.” About the 27th of December, I told them the Japanese had already passed San Pablo, Laguna, almost 100 kilometers away. It was then too late for the Americans to withdraw their money and they became very angry. Since the attack on Pearl Harbor, there was absolute blackout throughout Manila. We passed terrible nights. Oftentimes, we heard revolver or gun shots. We understand that it was to enforce the blackout. The guards also shot at persons moving suspiciously or signaling, or at the places where the signaling was coming from. We actually saw many such signals, evidencing the presence of spies and fifth columnists. The nights were dark and gloomy. I remember that we passed Christmas without the usual celebration. Some in our neighborhood tried to sing the Christmas carols, but they seemed in our ears like songs sang in necrological services. The thieves were also active. I remember that while we were downstairs on account of the air raids, a thief entered the second floor of our house. We heard the bathroom window creaking and we immediately ran upstairs and turned on the light in the room next to the bathroom. We found the door of the bathroom closed and we suspected the thief was still inside. In the meanwhile, the air raid wardens with an American Army officer were yelling from the street ordering us to put the light out, otherwise they would shoot. I quickly ran down to explain to the officer that there was a thief inside the bathroom. The officer went upstairs. Standing behind the closed bathroom door, he yelled to the thief to come out. He then broke in the door with his revolver. He found nobody: evidently, the thief had jumped out the window. There were practically no people going around at night. The cinematograph were open, but we never went. In the day time, there were many people in the streets. During air raids, the air raid wardens were kept very busy. These are paid employees and they were very strict in the performance of their duties. The warden in front of our house, a man by the name of Emilio, was especially efficient. We noticed that the white people were reluctant to obey him. I remember an incident which I witnessed. The warden ordered a white couple to stop because there was an air raid; but they continued on their way. The warden ran after them to stop them. An American officer happened to be around and he drew his revolver and threatened to shoot the warden if he insisted. The warden, fearing for his life, let the couple go. When the officer drew his revolver, I immediately ran to my house to get my revolver. My intention was to shoot the officer if he shot at the warden since the latter was merely performing his official duty. People were very careful about letting in anybody into their houses, even those caught in the streets during an air raid. Doors were always kept closed and locked. The reason for this was that there had been cases where bad elements took advantage of air raids to rob the houses. On or about December 28, 1941, Pres. Quezon, Vice Pres. Osmeña with Secretary Santos, Col. Roxas and Gen. Valdes fled to Corregidor. For several days before and after their departure, there was a heavy movement of American and Filipino troops fleeing Manila as it had been declared an open city. They went north to Bataan where they were to make their last stand. It was about this time when I received an order from the U.S. Navy to turn over the Marsman yacht anchored in front of the Yacht Club to the Navy, and another order from the Army to blow up all our dynamite cache in Camarines Norte, and all our oil. We had just received a consignment of over 4000 cases of dynamite and in preparation for the war our two oil tanks, one of which was the biggest in the Philippines, were filled up. On that same day, my son Tony who had finished training in the Cavalry Camp at Parañaque, and who was a Sergeant-Major in the Philippine Army Reserve received an order to join his regiment. He had been waiting for it; all his other classmates had received theirs. He prepared to comply with the order. I noticed that he was very, very anxious to do so. He envied his classmates, especially Apostol who only the day before left without him when his order did not come. Apostol never came back. Tony’s instructions were to report to the military headquarters in Pampanga. But when he arrived at the train station, the last train for the North had left and so had the last police bus that took reservists to their destination. Upon Tony’s insistence, I went to Malacañan to inquire and there I met Maj. Gen. Guillermo Francisco. I inquired from him as to how Tony could report for duty. He answered that the orders given to Tony and others which were issued on about December 9, 1941 had already been cancelled. Before the Japanese entered Manila, I as a Senator-elect and as such a high government official, discussed with Speaker Yulo, Mr. Vargas and other officials what we should do. Should we hide from or present ourselves to the Japanese military authorities? After due discussion, and following instructions allegedly given by Pres. Quezon, we decided to stay. However, I expected that we would immediately be called by the Japanese and as I did not want to be one of the first to be called, and as I wished to know first what the Japanese would do to the Filipino officials, I decided to go into hiding. I went to New Manila and hid in the house of Doña Narcisa de Leon on Broadway Avenue. I changed my name and everybody was instructed to call me by that name and not divulge my identity. I went there in the afternoon of the 29th of December. I was very well treated Mrs. de Leon who is our “comadre” and in fact by the whole family. They certainly took good care of me. Rizal Day, December 30, passed and for the first time since that day was made an official holiday, there was no celebration. The Japanese were expected to arrive and enter Manila on December 31, but they did not come. For the first time, I was not with my family when the New Year was ushered in. Like Christmas, there was no celebration of any kind. The usual fanfare and family reunions were conspicuously absent. There was a lot of speculation as to when the Japanese would enter Manila and what they were going to do. By the second of January, 1942, when the Japanese had not shown up, we learned that the Japanese contingent coming from the North was somewhat delayed and that coming from the South was waiting. I called up Mr. Ohnick and told him I was hiding and asked his advice as to whether I should stay in hiding. He answered that I better just stay home. So in the afternoon, I went home. I left my revolver in Broadway as I was afraid that if I were to encounter the Japanese I would be searched, and if found with a revolver, I would be shot. It was a memorable short ride home. At any time, I was expecting to meet the Japanese and I wondered what I would do. I passed through España St., Quezon Avenue, Quezon Bridge, Arroceros St., Plaza Lawton, Taft Avenue and San Andres St. I met no Japanese, but I saw spectacles which gave me a glimpse of the moral fiber of the Filipinos. It foreshadowed what was to come later -the shameful conduct of many of our countrymen of robbery consisting in illegal confiscation of goods, soulless profiteering on goods, including foodstuff, and rampant bribery of the police and other agents of the law who were charged with the prevention of illegal traffic of commodities and sale at prices in excess of those fixed by law. I saw big crowds all along the streets and at first I did not know what it was all about. On España St. I met people carrying all kinds of commodities, clothing, canned goods, etc. On Rizal Avenue, I saw persons forcing open the Chinese stores and carrying out everything, including furniture. It was rampant looting. People rushed into the stores like mad dogs. I reached the other side of Quezon Bridge and there I saw a big crowd snatching everything they could get from the old Ice Plant. I could see them carrying frozen meat and fish. On Lawton Square, on Taft Avenue, San Andres St., I saw the same thing. Some people used automobiles, “calesas” and “carretelas” to haul their loot. Many of them sold their wares right there on the street for very low prices; one could buy everything: clothing, foodstuff, furniture. I learned later that the goods came from the Port Area. Some bodegas were opened to the public. Other bodegas, however, were forced open. This was not to be regretted after all as the goods would have fallen into the hands of the Japanese. My chauffeur insisted in going to the Port Area with our automobiles. I refused to allow him to go. I prohibited all the members of my family and all those who worked for me to take any part in the looting or even to buy the looted goods. I consider it dishonest to acquire them. In fact, there was looting all over Manila. Right in front of my house they forced a Chinese store open and stole everything inside. The policemen who witnessed this looting were powerless. Some of the policemen were even seen to take part in the looting. It was a shame. I forgot to mention that during the bombing, every time there was an air raid alarm, American soldiers were stationed in various parts of Manila to watch for parachutists. Five American soldiers were stationed just outside my house. Whenever they came, we offered them coffee. It was in the afternoon of the 2nd of January between 5 and 6 o’clock p.m. when the Japanese entered the city. They marched down various streets, two of which were Taft Avenue and Mabini St. From Taft Avenue we could hear yells of “Banzai.” Those passing Mabini rode in trucks. We could see them very well from our house. For a victorious army, it was surprising that there was no show of pride. The next day, the people went out expecting excellent treatment as many of them sincerely believed that the Japanese would treat us as equals and brothers. That same day we were awakened to the reality that the Japanese were not as we expected. That very first day, there were incidents due to the fact that the Filipinos were being compelled to salute the Japanese sentries. Everybody was searched for arms, which was to be expected. But the Japanese civilians were very abusive. Sometimes, although the Japanese soldier had already searched the man and found nothing, the Japanese civilian who acted as interpreter would get his watch or other things. All automobiles were confiscated without ceremony. Even civilians confiscated automobiles. I was just about to leave my house in my automobiles when my friend, Mr. Schultz, stopped me to tell me the Japanese were confiscating automobiles and his automobile had just been taken. So I went walking along the boulevard to go to the Marsman building at the Port Area. However, at the Luneta, I was stopped by a Japanese sentry. Evidently, entry into the Port Area had been prohibited. On January 4th, an automobile with Japanese Navy officers stopped at our house. My family was scared. The civilian interpreter told me to get dressed and go with them. I was taken to the Marsman Building. I was made to wait at the anteroom of what used to be Mr. Jan Marsman’s office on the fourth floor. After about half an hour, I was ushered in. I saw a uniformed man who turned out to be the General and Chief of Staff of the Japanese Army in the Philippines. The General asked me many questions. He asked where Mr. Marsman was and whether the company was really owned by Britishers and Americans. He also told me he knew that Admiral Hart, the head of the American Navy in the Philippines had quarters in the building. He then asked where the telephone or secret communication to Corregidor was located in the building. Then the Japanese asked me for the keys to all the Marsman buildings and warehouses. I told them that I was Vice President of the Marsman Building Corporation and as such I was quite familiar with the plans of the building, and that I was not aware of any telephone communication with Corregidor. We went back to the Marsman Building where they took me all around the building to search for the communications equipment, but we did not find any. They thanked me and I prepared to leave. But before doing so I asked that I be allowed to go into my office to get a few things. They asked me for specifications and I especially mentioned the English Dictionary. My intention was that if I were allowed to get the dictionary I would then ask for other things. I had many valuable things in my office, such as important documents, parts of my diary, my collection of rare stamps, my photographs with Pres. Quezon and Mrs. Marsman, and other personal belongings. A Navy Captain escorted me to my office. But at the door, he stopped me and went inside. When he came out, he told me they would look for my things and deliver them to me at my house. On the way out of the building, I was looking all around, especially at the safes in which the companies had at least P60,000. The next day the Japanese came for me again. We went to the Marsman bodegas near the North bank of the Pasig River. I do not know why they brought me there as I was not allowed to go inside the bodegas. I saw various trucks parked in front of the bodegas. The caretaker told me that trucks had been coming frequently and that the Japanese loaded them to the limit with things taken from the bodegas. The next morning after the entry of the Japanese, I went to the Admiral Apartments on Dewey Boulevard. Mr. and Mrs. Benjamin Ohnick were expecting to be arrested by the Japanese at any time and that same morning at about noon, somebody had telephoned me that Mr. and Mrs. Ohnick were leaving with Japanese officers. When I arrived at the Admiral Apartments, they were gone. I just missed them by a few minutes. I saw their automobile being taken by the Japanese. I tried to stop the soldiers but they did not pay any attention to me. I lingered around the hotel. I met and talked with ex-Representative Pedro Sabido and Dr. Salvador Araneta. I found that Mr. Sabido decidedly in favor of a close relationship with Japan and membership to the Greater East Asia Co-Prosperity Sphere. This is the reason why in the sub-committee on Economic Planning of the Preparatory Committee for Philippine Independence, I made him Chairman of the Committee on the Greater East Asia Co-Prosperity Sphere. Araneta, on the other hand, was decidedly against any relationship with the Japanese. It should be remembered that he was one of the most active for permanent political relationship with the United States. The only high officials of the Marsman enterprises who regularly attended the Board meetings after the Japanese came were Mr. Welhaven, Mr. Ottiger, Mr. Velilla and myself. Von Ahren called a few times. Mr. Ohnick attended once at the San Luis office he was out of the the concentration camp for a few hours. The Japanese came once to inquire what we were doing. We announced that we were discussing our affairs. They asked whether we were licensed. We explained that we were not operating. There was an understanding in the company that we were to take care of the interests of the Marsman enterprises during this period. We held many meetings in my house on Calle San Andres where we discussed various affairs of the companies to do all we could to protect them. We decided to prepare an inventory of all the stock we had for such claims as we may later wish to make. Very little could be done as regards these two matters as it was most difficult to deal with the Japanese and they would not allow us to have access to the premises of the Marsman buildings and bodegas. I was to continue with any work that could be done for the companies as Messrs. Welhaven and Ottiger are whites and the Japanese are prejudiced against whites. Furthermore, Mr. Welhaven was a semi-belligerent as he was from Norway, the refugee government which had declared war against Germany and Japan. I did my best to get Mr. and Mrs. Ohnick released from the concentration camp in Sto. Tomas University. I used to send a few things to them and to other Marsman men at the camp. I generally went with Mr. Velilla and Mr. Ottiger. I shall never forget those visits. Those Japanese guards were very hard to deal with. I carried a pass from Colonel Watanabe. We had to go through all kinds of difficulties to get in. My papers were scrutinized. We were usually made to wait at the gate for a long time. There we saw many Filipinos slapped and treated like dogs. We feared that our turn would come. Many times we could talk only in the presence of the Japanese. I often went to see the Superintendent since it was easier to talk to him to ask him to be allowed to talk to internees without any guard present. When leaving I generally would loiter around the grounds to talk to different people. I knew I was exposing myself to danger in doing so. One of the internees, Mr. Kelly, a high official of Marsman Company who was one of my best friends in the organization, was suffering from something which required him to go to Dr. Gonzales on Legarda St. Every time he went, he called me up. I always took him back to Sto. Tomas in my automobile where we would have a good chat along the way. I continued my efforts to get Mr. and Mrs. Ohnick out of the concentration camp. Mrs. Ohnick was released because she was sick most of the time. Mr. Ohnick was able to get permission once in a while to be out of the camp for a few hours. I went to talk to the Superintendent about Mr. Ohnick. I told him that I would like to have Mr. Ohnick released in view of the fact that his wife was sick. I explained to him my relationship with Mr. & Mrs. Ohnick. I said that Mr. Ohnick was the Vice President of Marsman & Company, and that I was a member of the Board of Directors. Mr. Ohnick, when interviewed by the Superintendent, mentioned that his father was a pure blooded Japanese. I knew this, and I also knew that his father’s name was Oniki, but I never mentioned it. The Superintendent decided to release Mr. Ohnick to me. Of course I had to guarantee his good conduct. Mr. & Mrs. Ohnick moved to a house near the Rizal Memorial Stadium where I visited them quite frequently. Mrs. Ohnick was in very poor health. Mr. & Mrs. Francisco were also released as Mrs. Francisco was very sick. They occupied a house in New Manila where I visited them. I noticed that their house was being watched by the Japanese police. I pitied them very much as they complained that they could not get some essential things like laundry soap. Mr. Francisco attended a few of the meetings of Marsman & Co.
Mr. Ohnick was present in various meetings in my house and in a meeting at the Marsman store and shop at San Luis St., almost directly in front of the Agricultural Building. At one time. some Japanese came and asked whether we had license to operate the store. We answered that we had not opened the store and that we were merely having an informal meeting. This store was later seized by the Japanese. In these meetings attended by Mr. Ohnick the main question discussed was whether or not we should continue the business. The consensus of opinion among us was that we should suspend operations of the company. However, upon my suggestion, we filed a petition to operate. My reason was that if we did not apply for a license to operate, they might take this as an admission that it was an enemy company. We were contending that it was not enemy property inasmuch as the majority stockholders were Mr. and Mrs. Marsman who were naturalized Filipinos. I forgot to state that Mr. Francisco, another high official of Marsman, was also present in some of those meetings. The Japanese never took action on our petition, and in the meanwhile they continued taking everything in the store until nothing was left. It was agreed that I was to take charge of protecting the properties and interests of Marsman enterprises and that I was to act on matters that may come involving the enterprises. I was also to study future plans for the activities of the company during the Japanese regime if we ever decide to reopen. Upon the request of my friends in the concentration camp, I suspended sending food or even visiting them. I noticed that I was being watched very closely. I remember one incident. We had a party in the house of Mr. and Mrs. Ohnick. All of them, with the exception of myself and Velilla, were Americans, Englishmen, Norwegians and Swiss. It was to celebrate the birthday of Mr. Ohnick and I went there with that understanding. The next day there was a full report about the party by the Military Police. The report stated that it was to celebrate the birthday of Mr. Marsman. It turned out that it was the birthday of Mr. Marsman and that the party was intended for him also, but I did not know this. Because of my close relations with the Americans, the Japanese became suspicious of me. They complained to Malacañan. Knowing that drastic action would be taken against me, I desisted from visiting and sending food to the camp. My friends well understood my situation. The Japanese Army entered Manila on the 2nd of January, 1942. Before their entry, the government made all the necessary preparations. Vargas, the Secretary to the President, which position made him a ranking member of the Cabinet, was at the same time appointed by Pres. Quezon as Mayor of Manila. He was the one charged with the painful duty of surrendering Manila. This was called Greater Manila as the municipalities around Manila –Pasay, Parañaque, San Pedro Makati, San Juan, and Caloocan– were incorporated into Greater Manila. Quezon City was also made a part of it. The purpose in creating a Greater Manila was so the whole area comprising those cities and municipalities could be included in the declaration of open city. Vargas and Laurel, got in touch with Katsumi Nihro, then Japanese Consul General in Manila. In the meanwhile, all the policemen were disarmed to prevent any incident which might result in combat with the Japanese. They were merely provided with walking sticks. Big streamers were placed along Taft Avenue and P. Burgos St. by the City Hall, warning the Filipinos to keep the peace. Vargas surrendered the city without any incident. He was told by the Japanese to continue as Mayor. He as well as Laurel were approached by the Japanese about forming a Central Government. Kihara, former Japanese Vice-Consul in Manila, took part in the negotiations. General Hayashi, an old friend of Laurel, called him also about forming a government. Aquino and Recto were approached by their friend, Kanegae. Later, Mori talked with Paredes on the subject. Laurel was the Secretary of Justice and Acting Chief Justice; Aquino was a member of the Cabinet before the last reorganization of the Cabinet by Pres. Quezon and was slated to be the Speaker of the next House of Representatives; Paredes, Floor Leader and Speaker-elect; Recto, Senator-elect. Aquino, Paredes and Recto talked to Yulo who was then Speaker of the House and slated to be the President of the Senate. Yulo decided to consult Chief Justice Avanceña, the grand old man of the Philippines, whose views are always sound and whose patriotism had already been tested. He then called the other members of the Cabinet before the last reorganization to a meeting –Teofilo Sison, Rafael Alunan, Jose Fabella, Serafin Marabut, Jorge Bocobo. Fabella could not attend as he was sick. Later, they called all the Senators in Manila. These were Ramon Fernandez, Vicente Madrigal, Melecio Arranz, Eulogio Rodriguez, Elpidio Quirino, Arnaiz and myself. The House of Representatives in a caucus designated the following to attend the meetings: Jose Zulueta, Eugenio Perez, Jose Veloso, Tomas Oppus, Prospero Sanidad, Alfonso Mendoza. Finally, prominent people were called and those included Gen. Emilio Aguinaldo, President of the first Philippine Republic; Ramon Avanceña, former Chief Justice of the Supreme Court; Miguel Unson, a businessman and civic leader; Alejandro Roces, another statesman, owner and publisher of the influential newspapers. Juan Sumulong, the president of the Democrata Party was included in the list. When he was approached by Secretary Bocobo, he answered that he would consult his men. He died before he could do this. There are others whose names I could not remember just now. Many meetings were held in the covered glorietta by the swimming pool on the left side of the palatial house of Speaker Yulo. It was an ideal place for secret meetings. Almost all expressed their opinion very freely. Each had the courage to make his conviction known. The discussion was very thorough. Everybody was aware of the gravity of the situation and the momentous decision we necessarily had to make. Some were in favor of the establishment of some form of government; others were not. We were, however, agreed on one point. Under no circumstances would we accept any arrangement unless our independence was guaranteed. We made it very clear that we would not give up the freedom for which our forefathers had lavishly shed their blood. Evidently, the Japanese negotiators transmitted this to Tokyo as Premier Tojo, on the 21st of January, in a speech before the Diet, promised independence for the Philippines if conditions of peace so warrant and if the Filipinos understood and cooperated with the aims and purposes of Japan, such s the establishment of the Greater East Asia Co-Prosperity Sphere. After due deliberation, we decided not to form a government, but to have an organization which would merely cooperate with the Japanese civil administration in the Philippines. The Japanese, therefore, established their own civil administration in the Philippines which had all the departments and all the attributes of a government. On the other hand, the Filipinos organized a Commission with the Chairman as its chief executive. As it turned out, the work of the Commission was of an auxiliary nature only. It could only decide routine or unimportant matters; all important matters, such as legislation and decision on policies had to be submitted to the Japanese Administration for approval. (1) To be assured of our independence whatever the result of the war might be. (2) To be in a position to help the people. We knew the record of cruelty and brutality of the Japanese in China as many films had been shown in Manila depicting the atrocities of the Japanese. In our own country, slapping, unjustified arrests, illegal confiscation of private properties, and many other forms of abuses, had already become a common everyday happening. What could we do? We, who had repeatedly received the confidence of our people, could not forsake them precisely at a time when they had great need of us. Our personal interest should be of no account; no sacrifice is too great if dedicated to the cause of the people. We accepted, not necessarily because we were sure we could do much for our people, but in order to place ourselves in a position to help. Whether we succeeded or not only history will judge. Passion now runs high that even the most obvious might be overlooked. (3) But our principal reason was that if we did not accept, the administration would fall into the hands of men like Artemio Ricarte, or an irresponsible person like Benigno Ramos. We are not sure that Ricarte is not a patriot. His record as a revolutionary figure points to his greatness and patriotism. But he was already over 75 years old. Somebody would have to govern for him, and history tells us that a government directed by another man behind the scene is dangerous as it generates the most iniquitous acts or acts of oppression by the government. His conduct in connecting himself with the Makapili has proven that our fear was well founded. Furthermore, Ricarte lived in Japan and was pro-Japanese and there was no one in our meeting that welcomed Japanese influence in the Philippines. Why did we think Ricarte might be head of the government? Because he came with the Japanese Expeditionary Forces and from the very beginning he was proclaiming that he was in favor of a dictatorship. If not Ricarte, we were sure that the head of the government would have been Benigno Ramos, the head of the Makapili. He is so well known that it seems unecessary to describe him. Suffice it to say that he was an ambitious man and a degenerate. The only thing he thinks of is how to exploit other people. The many cases of “estafa” were the best proof of this assertion. He is a man without moral principles. He would not hesitate to kill to attain his purpose. The number of people killed by the Sakdals and the Makapilis is proof of this. In a government under Ramos, the people would be driven to start a revolution for they would not tolerate such indiscriminate killings, Many of Ramos’ men –Sakdals– were killed by their own countrymen; in fact they had to concentrate themselves in places under the protective wings of the Japanese. The Filipino would have been the victim as Ramos would have been aided by the Japanese Army. A government under Ricarte or Ramos would be used by the Japanese to commit cruelties and murders of the Filipinos. (4) The last reason, which is no less important than the previous ones, is that we felt we were merely complying with the instructions of Pres. Quezon. These instructions are stated somewhere above. Whether we have complied faithfully or exceeded our authority, only history will decide. It should be remembered that the instructions contain no detail and all we could say for the present is that all our acts were done in good faith. If at times we apparently had exceeded our authority, it was exclusively for the purpose of avoiding a cataclysm, a great misfortune. In those instructions, Pres. Quezon foresaw the danger in leaving a government open to men like Ricarte or Ramos. But I should reiterate that the Commission organized was not a real government. All its acts were merely delegated or had to be approved by the Japanese civil administration. We had hundreds of cases where we tried to do something or to do it in a different way, but the Japanese just did things or had them done in accordance with their whims and desires. The Office of the Director-General in the Japanese Administration was really the head of the government. It was occupied by Gen. Hayashi, and leter by Gen. Wachi. When it was certain that a Commission was to be organized, somehow it got into my head that I may be appointed to the Commission. I wanted to avoid it by all means. As Vargas was the one dealing with the Japanese, I sked him not to have my name considered at all. Upon my insistence, he promised. He even showed me the proposed list wherein Yulo was suggested for Commissioner of Finance. When the list came out my name appeared. I became, to use a vulgar expression, groggy. My wife cried as she knew what that meant. She feared we would be in constant danger; she really hated public service as during my 29 years of service I got nothing but disappointments. I immediately went to Vargas to see whether I could decline. Vargas answered emphatically that I could not, unless I wanted to endanger my life. I consulted Mr. Ohnick. He understood the situation. He advised me to accept it, but to resign after three months. I consulted Vargas again and he said that he was aware of my situation, that he would help me get out after three months. I therefore asked for a three-month leave from Marsman & Co., which was granted. Such is the story of my acceptance. After three months, I asked Mr. Vargas to allow me to resign. He said that it was not yet time. I asked and obtained another month’s leave of absence from Marsman & Co. At the end of the month, Mr. Vargas asked me to stay. He told me that it was for my own safety as he was sure the Japanese would consider my resignation a hostile act. Mr. & Mrs. Ohnick were taken to Sto. Tomas again when the Japanese, for reasons I do not know, recalled all former internees, including the old and sick, to the Sto. Tomas concentration camp. Last night, we received the memorandum order of May 15, 1945, providing for the classification of detainees. Therein we are called “limited assimilated prisoners of war”. The order is issued in accordance with the Geneva Convention. We were detained probably pursuant to (g) paragraph 76 of the Rules of Land Warfare adopted to Geneva. According to this provision, “Persons whose services are of particular use to the hostile army or its government, such as the higher civil officials x x x, may be made prisoners of war.” I doubt the applicability of this provision to us. The Philippine Republic during the Japanese occupation not being recognized by America, its declaration of the state of war was illegal and null and void. If so, the Philippines was not only not an enemy, but an ally. This was evidenced by the fact that Filipino soldiers fought side by side with the American soldiers. The order classifies those in this community into two: those with “Officer Status” and those with “Enlisted Status”. Those belonging to the former are Emilio Abello, Rafael R. Alunan, Sergio L. Aquino, Sergio Bayan, Antonio de las Alas, Francisco C. de la Rama, Guillermo B. Francisco, Vicente Madrigal, Jose Paez, Quintin Paredes, Claro M. Recto, Pedro A. Sabido, Jose G. Sanvictores, Proceso E. Sebastian, Teofilo Sison, Jose Urquico, Jose Yulo and Francisco Zulueta. To the Enlisted Status belong all other detainees in this camp. I repeat that we did not ask for classification to foment class distinction and because we do not want to mix with the other people in the compound some of whom are very poor or very ignorant. We of course would prefer to be in quarters separate from the present compound for the sake of more comfort and sanitation. But if classification does not result in separate quarters, we would have preferred to let things stay as they are. Our companions have been true friends to us. I also admire their spirit of helpfulness. There are many of them who whenever they see us working insist on doing the work. Their attitude is very encouraging. It shows that complete union of the Filipinos can be realized. One of the main differences between the two classes is that the officer class will not be required to work. The enlisted class may be so required. I forgot to state that the officer class were former governors, chiefs of bureaus, cabinet members, as well as heads of the military establishment under the Japanese. In the memoradum order, there is an expressed prohibition for an officer to have a personal servant, and those in the enlisted class are not permitted to act as personal servants to any other individuals confined in the camp. Undoubtedly, this prohibition has been purposely prescribed. We so-called big shots are being charged with using the others as servants or as orderlies. This is of course far from the truth. We have never required anybody to work for us, nor have we requested them to do so. Any service rendered by them has been entirely voluntary and upon their own initiative. They know that we are not used to doing manual labor, and following the Filipino custom and tradition, they insist on doing the work for us. In the provinces, if you have been good to your neighbors they would not allow you to do manual work. I believe this is also the case in the United States and everywhere else. The leaders are supposed to do the intellectual work, the manual labor being performed by those not prepared for the intellectual and technical work. Nevertheless, we insisted in doing manual work. Even Chief Justice Yulo and the millionaire Vicente Madrigal had to take a broom and sweep. In accordance with the memorandum order, all detainess had to elect a spokesman. He is to act, not only as liaison officer, but as the representative of the detainees in presenting their grievances and complaints. We elected for the position Speaker Quintin Paredes, a very able and worthy man for the position. We virtually have constituted him the leader of the officer class. The enlisted detainees also had to elect one group leader for every 250 men. For this position, they elected Dr. Hilario Camino Moncado. Both elections will have to be approved by the commanding officer of the camp. Unfortunately, the men belonging to the enlisted class have not been taking the matter very seriously. They joke a lot about it, and I am afraid this time they’ve gone too far. They held an election for assistant leader, although the memorandum order did not provide for such position. The joke was that they put up as candidate a man called Tony, who had been acting as a sort of leader or boss, to run against a man by the name of Cuaresma, who is mentally retarded and physically deformed. Tony had been a good and strict leader, but he lost to Cuaresma who obviously could not be a leader. Naturally, this action irked and angered Tony and now there are division quarrels among them and complete disorganization. Dr. Moncado could not control them; he has resigned. I must preface the following discussion by stating that we have reached very definite opinions on certain points: that because of the improper, brutal and even uncivilized conduct of the Japanese in the Philippines, the Filipinos cannot be for the Japanese and will hate them for generations to come; that there is no comparison between the Americans and the Japanese, and if we had to choose between the two, we certainly would vote for the Americans 100%. But although comparison is odious, we would like to compare the treatment accorded by the Japanese to government officials, and the treatment now being accorded us by the Americans. When the Japanese came they did not arrest nor even molest the Filipino officials. On the contrary, the Japanese offered them the government. The Filipinos were of course reluctant to even consider it. But when they saw that the people were suffering because of abuses on the part of the Japanese soldiers, they accepted believing that they would then be in a position to help and save their countrymen. They discovered later that they could do little. Worthy of mention also in this connection is that, after a very short detention during which they were given what the Japanese called “rejuvenation course”, our officers and enlisted men in the USAFFE were released. Whenever we compare this treatment with that being shown to us now, we cannot help but express indignation. We are very bitter. We have been arrested, deported and imprisoned. According to announcements it will be for the duration of the war. What makes it very painful is that we had all been staunch supporters of America before the war; that from the beginning we had prayed fervently for the return of the Americans and for the victory of the United Nations who, we were told, were fighting for individual liberty, for democracy and the right of small nations to continue their independent existence. Being a liberty loving people, the Filipinos wholeheartedly supported America to the extent of sacrificing the flower of our youth. (About 100,000 young men died in Bataan and other places). What makes it very painful is that we did not have the least intention of serving the Japanese; our sole purpose was to serve our people. At the very first opportunity, we travelled over steep and almost impassable mountains, rivers and ravines to reach the American lines, and we had never experienced such happiness, forgetting our fatigue and sacrifices, as when for the first time in over three years we saw an American soldier. Now these same people that we have waited for so long have arrested and placed us in a penitentiary. What a disappointment! What a paradox! Today, a Colonel from Manila came for inspection. He went through the premises and left apparently satisfied. But he said something in a very emphatic way which indicates the belief they entertain about us. He said that we must not attempt to communicate anything by any means, such as codes, marks, figures, etc. Their censors are experts and our attempt will be discovered. We are afraid they take as all for spies and traitors. There was blackout tonight. But no enemy planes appeared. The blackout lasted for only a few minutes so it might have been just an air raid practice. Japanese planes have almost all been destroyed and it is just unthinkable that any of them could reach Palawan especially in view of the fact that they seem to need all their planes somewhere else. It is rumored that Gen. MacArthur is coming on the 20th. We do not know the purpose of the visit. But we shall see. I had considered Minister Jose Paez as one of those absolutely content with his lot. Being a quiet man, he has never been heard to complain. In my conversation with him today, I found that he is resentful of the treatment accorded to us. He believes that there was deceit in that we were not told at all that we were going to be arrested, detained and deported. The Americans ignored the idiosyncracies and customs of the Filipinos; we were not given any opportunity to see our families or, as in his case, to see whether they had left Tubao for Manila, and if so, where they lived in Manila. The Americans do not know the attachment of a Filipino to his family. Chief Justice Yulo has been sick during the last few days. He has not been going to the mess hall. We all believe that the only thing the matter with him is he worries too much and broods constantly. He just cannot understand why he should be detained and deported after his attitude of defiance against the Japanese which almost cost him is life and after he had served the cause of America. I do not mean to make this a “Who’s Who”. But there are other personalities, characters and persons in this community of which special mention must be made. The first is Don Vicente Madrigal, reputed to be the richest man in the Philippines. He was a schoolmate and one of the most intimate friends of Quezon and Osmeña. In fact, they used to confide in him their innermost secrets. From a humble beginning as a coal dealer, he became the coal king of the Philippines, controlling the greater portion of the coal business. He later expanded his business to almost every branch of business endeavor. He became a shipping magnate, a large scale merchant, a manufacturer (cement and sugar), an agriculturist, etc. His name was connected with almost all the big businesses in Manila. In recognition of his rise in the business world, he was elected president of the Philippine Chamber of Commerce many times. He became a real tycoon. Pres. Quezon recognized his ability, and although he knew that Don Vicente loathed politics, he compelled him to be a candidate for Senator in 1941. He was elected, but the war came and he was not able to occupy his seat. During the Japanese regime, he was a member of the Organization Committee of the First Council of State, the preparatory committee for Philippine Independence which drafted the Constitution of the Philippine Republic and the Planning Board. Probably more will be heard of Don Vicente when the rehabilitation period comes. It will be a crime not to make full use of his experience and unquestioned ability. There is another person of an entirely different type. He is a notorious character. He is Francisco C. de la Rama, alias Francisco Concepcion, alias Francisco Angeles, and now F.C. or Frank. His admirers call him “Don Paco”. I tried to avoid mentioning him as I do not care to talk about the bad side of anybody, especially those who, like De la Rama, are with us and who do their best to comfort and help us. But today he himself told us his whole story. He misappropriated funds belonging to Bachrach & Co. while he worked for them as a sales agent in the Bicol region. His picture was at one time posted throughout the Philippines for having been accused of “estafa” by the Gonzaga’s of Negros. A prize of ₱500 was offered for his arrest. He fled to Singapore and to other foreign countries. But he became homesick and returned to the Philippines. He was in hiding in Jolo, in La Union, and in the Ilocos region. Unfortunately for him, he was discovered and arrested everywhere he went. However, he always managed to keep out of jail by bribing the arresting officers. At one time, the very Constabulary officer who arrested him helped him escape to Baguio. It was then the time of the mining boom. He bought over 40 mining claims for ₱200 each and sold them at ₱5,000 each. With this large sum, he was able to settle all claims against him. He then assumed the surname of De la Rama pretending to be the nephew of the big millionaire, Don Esteban de la Rama of Iloilo. Because of his name, he was made Director of a mining company. He was later accused of “estafa” with more than 50 counts against him by the stockholders of the company. He was convicted only on one count and sentenced to one year and eight months, but as he was a recidivist he was given an additional sentence of 10 years. He probably was pardoned because when the Japanese came, he became the foremost “buy and sell” man. He made millions easily in his business with the Japanese Army and Navy. He also became one of the biggest men in the real estate business. His name was heard everywhere. He overshadowed famous names like Madrigal, De Leon and Fernandez. He especially became famous because of his published donations to charity of thousands of pesos. He gave money to the Government for scientific research. He donated a big sum to the “Timbolan” to feed the needy. He made large donations not only to institutions, but also to individuals. It is said that upon his arrest, a big demonstration of laborers was staged demanding his release. He is now with us. He has been very helpful to everybody. He seems to have been able, by his usual means, to elicit the good side of the guards and, for this reason, we are now able to receive things from the outside and to send out anything. He is still young and if hereafter he becomes careful with his conduct, he may still be a real power in the business world, being an intelligent and able man. There is a real personality in our group. I am referring to Major Gen. Guillermo B. Francisco. This is the highest rank that has ever been attained by a Filipino in the U.S. Army. In 1908, he was one of the first graduates of the Philippine Military Academy in Baguio. He rose from the ranks. In each province where he was assigned, he left a record for efficiency and wise and impartial enforcement of the law. He could not be bribed nor influenced by politicians. For this reason, politicians in some provinces molested him by presenting unfounded and absurd complaints. He was Chief of Staff of the Constabulary for many years. In 1936, he received his just and well merited promotion to Brigadier General. From 1938 to 1941, he was Chief of the Philippine Constabulary. Just at the beginning of the war in Dec. 1941, he was promoted to Major General and continued as Chief of Constabulary, which afterwards became a division of the Philippine Army. Upon the induction of the Philippine Army into the U.S. Army, he naturally became a Major General in the U.S. Army. As such he also had to retreat to Bataan where he was placed in charge of a very important and strategic sector. He acquitted himself very creditably. While there he was ordered by Gen. Wainright to go to different places for pacification. Believing that it was for the interest of his country to maintain peace and order, he did his best to comply with the instruction of Gen. Wainright. When Bataan surrendered, the Japanese placed him in the concentration camp at Camp O’Donnell. He was later transferred to Camp Stotsenberg where he with hundreds of other captured USAFFE officers were required to finish a rejuvenation course prescribed by the Japanese. He was returned to Camp O’Donnell where the Japanese requested him to organize the Government Employees Training Institute for the rejuvenation of public employees. And so he was released. His stint with the training institution was cut short by his appointment as Chief of Constabulary with the rank of Major General. But this too did not last long because the Japanese did not trust him. He was relieved as Chief of Constabulary. The Japanese were right as his sympathies were with the guerrillas; as a matter of fact, he did not take action against Constabulary men who deserted and joined the guerrillas. He had even formulated plans to convert all the Constabulary to guerrillas when the proper time came. After his relief, Pres. Laurel made him Chairman of the Advisory Board for Peace and Order. The President in doing so only wanted to save the General as he knew that the Japanese would otherwise arrest him and kill him. Together with Generals Manuel Roxas and Capinpin, he was forced to go to Baguio and there subjected to a very close surveillance. They assigned a Japanese Military Police to watch him. He was very anxious to rejoin the U.S. Army so that at the very first opportunity, he escaped from Baguio to go to the territory occupied by the Americans and present himself to them. He reached the American lines in April. Almost immediately after his arrival he was taken to Manila and there detained. He was subjected to the humiliation of photographing and fingerprinting. He was so indignant that he wept. He was later deported to Iwahig Penal Colony and is still with us. He is terribly bitter. He said he cannot understand why when the Japanese got him, he was put in a concentration camp and now that the Americans are here he is also imprisoned. Gen. Francisco is only 60 years and much more will be heard of him. There is another person I would like to mention. He is Mr. Esteban Marcelo, an old man probably in his seventies. He is the biggest fisherman or fish dealer in Tondo. He is a friend of many big and influential public officials, especially Minister Paredes. Before the war, he frequently inivited high officials for a fish dinner at his house. During the Japanese regime, Japanese Military Police were seen quite a number of times eating dinner at his house. Such an act is now being considered as cooperation and for this reason he is now with us. We have one military governor of a district and that is Hon. Sergio Aquino. We have also one provincial governor, Mr. Jose Urquico. Aquino is the Military Governor for the Third District and Urquico the Governor and later the Deputy Military Governor of Tarlac. They were accompanied by a young man by the name of Rafael Aquino. Why were these Military Governor and Provincial Governor singled out when there were so many military and provincial governors? And why was Rafael detained since his arrival in the Philippines from Japan, when he is only a boy without any record of service to the Japanese? Probably, there are other governors who have cooperated more actively and effectively than Aquino and Urquico. The only explanation that could be found is that Sergio Aquino is a relative and brother-in-law of Benigno Aquino, Sr.; Jose Urquico is also a brother-in-law of Benigno. Benigno Aquino was Speaker of the National Assembly and as such he was the second man in the Philippine Government officialdom. He is known to be the most rabid pro-Japanese. He had made many virulent speeches against America and the Americans. He is considered even more Japanese than Pres. Laurel himself. He went to Japan with Pres. Laurel and we can now almost surmise what would have happened to him if he had stayed in the Philippines. The conquest of the Central Plain of Luzon was a successful one. The 210 kilometers between the Gulf of Lingayen and the City of Manila were negotiated in 27 hours instead of 27 days. Except in Bamban and Stotsenberg where the enemy had attacked from the nearby hills, the Yankee war machinery rolled through the wide open fields without opposition. The enemy had lost the battle of Luzon when it allowed the gigantic invading equipment to land unopposed. In the open fields, the Japanese could not put up a fight. They preferred to retreat in disarray, dispersed like scared rabbits as the mechanized columns of the invaders rolled by. Yamashita’s strategy was to convert the mountain ranges of Caraballo and Zambales into another Bataan, in the manner of MacArthur’s defense three years ago. The Imperial Army was entrenched in the rugged mountains without roads and almost without any footpaths, turning each mountain into a fortress, each hill into a machinegun nest and each cliff into a trench. They dug a complex of tunnels of communications through the mountain where they hid and installed their artillery. They fired from the mouths of the tunnel to avoid being localized by the American Air Force and artillery. The Americans had to destroy these subterranean hideouts one by one. Not only did they blow up these artillery nests. They chased those who manned the guns and flushed the others out of the caves and tunnels who defended themselves like corralled beasts. Under this mode of defense, it was not necessary to launch big battles nor heavy attacks nor fighting on a grand scale, nor mechanized campaigns. It was a work of mopping up, a fight of a group of hunters against a group of game animals. The air force, the tanks and armoured cars were hardly of any use. Only the rifles, flame throwers and hand grenades were effectively utilized. It was a slow, tedious, lousy and bloody fight.